Over 132 Cities to save and over 400 levels! Over 50 different power-up combinations! Earn Gold Medals and over 120 Trophies! Duel your friends in Hotseat Mode! Evil Orbs is rated 3.6 out of 5 by 8. Rated 5 out of 5 by treklady1 from A litte pinball, a little tennis, and a little brickbuster A fun game that obeys the laws of physics. The ball arcs off of your paddle like lobbing a tennis ball. The speed of the paddle is adjustable with 5 settings from very slow to very fast as well as paddle "mode" settings. I liked it on the "very slow" setting since I prefer my games to be on the more casual side. It also has a few difficulty modes. 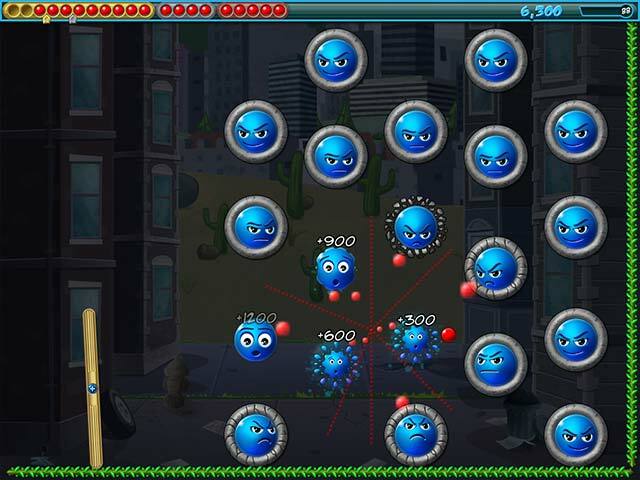 The ball bounces around like a pinball to take out multiple orbs with a single shot. It also has power ups to help you along the way. I only played for a short time before deciding that it was something I would enjoy and to hit the "Buy" button. All in all, a fun little game. Rated 4 out of 5 by kgustavson from Arcade fun!! Welcome back GoBit Games - we've missed you! This is addictive fun, and if you're a stickler for getting all gold then you'll be playing this for a while. Lots of power-ups to choose from at the beginning of each level. And as always with these devs, a good dose of humor. Rated 4 out of 5 by campingramps from The Orbs have a mind of their own This is a new and unusual game and I liked it. Cross between breakout and bubble breaker with a little badminton thrown in. I must say, this is an intense game and you better have your game face on because this will throw you for a loop if you aren't careful. The bonus' available are nice and useful except for the growing ball, I wasn't fond of that one and the double ball and the force field were probably the best. I don't know if I like this enough to use a credit on it but I will finish the demo at least. This is a definite recommendation for the fun factor if nothing else. Play the demo but don't pull your hair out in frustration. There is a relaxed mode. Have fun! Rated 4 out of 5 by LunaNik from This game saves the world from a life of total bummerness. 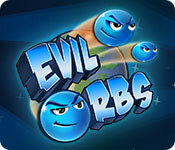 Evil Orbs is an adorable and well-designed physics-based arcade game. The orbs have deployed over the world’s cities and must be destroyed. 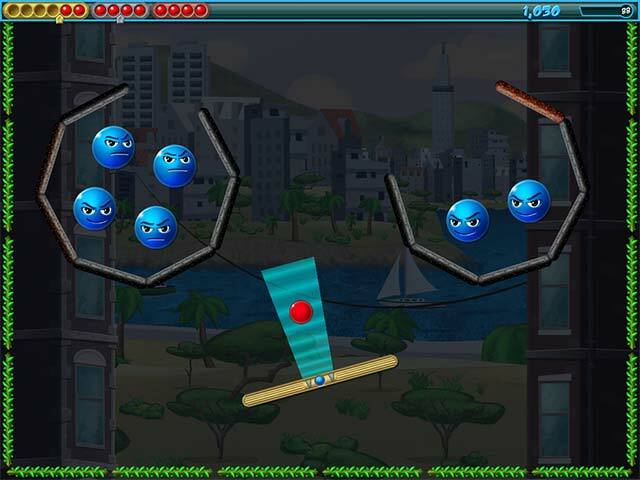 Each multi-screen level represents one city which you must defend by popping all the orbs. Your Weapon A simple paddle which is locked in one place, but can be rotated. Your Ammo A red ball which you initially shoot then deflect from the paddle. As the levels progress, you also get a series of power-ups like: • Target - shows a line which the ball will follow when you shoot it • Double - gives you two balls instead of one • Grow - makes the ball increase in size every time it hits something • Lasers - lets you shoot lasers from the ball one time during its flight • Walls - adds a second layer of walls around the edges of the screen The Obstacles As the levels become more difficult, the orbs will don armor of various types to protect them. They’ll construct walls you’ll have to knock down. And I’m sure it’ll get to a point where they will be able to shoot your ammo out of the sky. The Controls In the Options Menu, you’ll find customizable controls for your mouse. There are five settings for speed. I played using “normal” (because I have tracking speed set two-thirds of the way to “fast” and it was perfect. There are multiple options for how you wish to control the rotation of the paddle: up/down, left/right, circles, etc. And you can switch to keyboard control as well. Overall, I found Evil Orbs to be a good game with a humorous backstory, a well-balanced learning curve, and sufficient variety to make it not feel repetitive. Plus, those orbs may look evil, but they’re too cute for words. Rated 4 out of 5 by jimeezlady from Old school fun! Played through the first 7 cities and purchased. Reminds me of a cross between Breakout and a Bubble popper game. Mouse controls are fully customizable through the options menu! Use left/right, up/down or whatever combo works for you. Can also change the mouse speed if it's too sensitive. 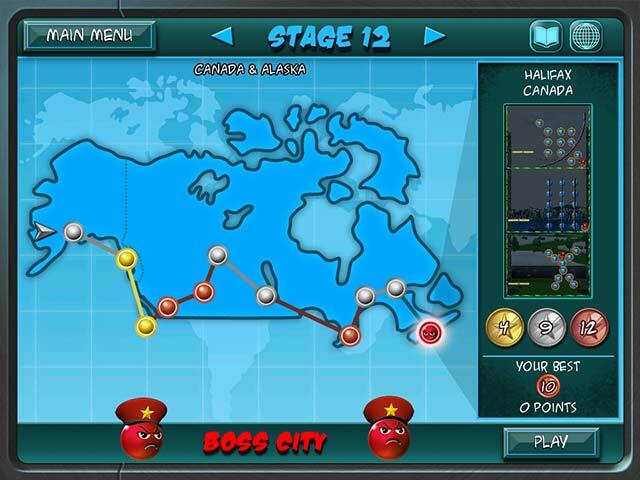 You get great "power ups" for each completed city like sticky paddle, 2 balls, double wall etc. Great fun and a nice change! Rated 4 out of 5 by Daxadillion from Going Mad! The very first game I purchased from BFG was Peggle in August 2008. I was babysitting for my 5th grandchild aged 4 and he cried non stop until I bought it. This game is a bit similar but without the pretty graphics Peggle had, making it a lot harder to get a perfect score. I could not stop laughing at the expressions on the balls' faces when my ball was heading towards them. Further into the demo we get red Patrol balls that can produce new balls for the ones I had already hit, making it even harder. I found the mechanics a bit difficult to get used to at first but once the Power Ups were available after clearing the first stage it got easier. There are 9 Power Ups including Grow Ball, Force Field, Sticky Paddle, Tractor Beam and a Laser that can shoot in 8 different directions which makes the game a little easier. Give it a go. Rated 1 out of 5 by pennmom36 from Mouse Controls Way Too Sensitive Normally, I love a good arcade game based on physics, but this game is so not fun because the paddle used to launch and ricochet the Antiorbiom Balls, is too hard to control. This would however be a fun game for your phone. You can play in several different modes, Adventure, Relaxed (unlimited balls) Duel (play against a friend) or Challenge mode with fewer balls available. The objectives are the same with each level, destroy all Evil Orbs before running out of balls, the fewer balls you use the more points you will score, and if you earn enough points, you will receive extra balls. You can earn a Gold, Silver or Bronze award, and there are 120 Trophies to achieve. This game is similar to pinball where you rotate a paddle to help the ball ricochet to hit more targets, if the ball fails to bounce off of the paddle, you will lose that ball. To move the paddle, you have to move the mouse ever so slightly up and down, and I do mean ever so slightly because a jerky movement or too far up and down, the paddle will go haywire. You can also use the keyboard controls but who wants to do that?